The 2016 Fair Grounds Oaks Field Features Californian Fillies: The Grade II $400,000 TwinSpires.com Fair Grounds Oaks has been the most influential prep for the Grade I $1,000,000 Kentucky Oaks for more than a decade. Six of the last 11 winners of the 1 1/16-miles race have gone on to win its Kentucky equivalent, including Ashado, Summerly, Proud Spell, Rachel Alexandra, Believe You Can and Untapable. 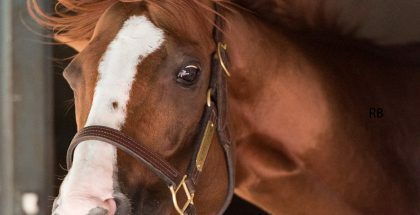 In 2015, I’m a Chatterbox used the race as part of a powerhouse season that made her an Eclipse Award finalist for top 3-year-old filly. This year, with divisional leader Songbird dominating out west on her way to the Kentucky Oaks, two fillies who finished astern the champion last out head east from California to take on the top Fair Grounds fillies. Land Over Sea will try to do what 2007 winner Mistical Plan did for trainer Doug O’Neill and owner Reddam Racing when she breaks from the outside post eight under Hall of Fame jockey John Velazquez. The multiple Grade I-placed daughter of Bellamy Road has finished behind Songbird in five straight races, including last out when second behind her for the third time in her seven-race career in the Grade III $100,000 Santa Ysabel Stakes on Mar. 5 at Santa Anita. A late-closing sort, she should appreciate the famously long stretch of the New Orleans oval. A lot of the same can also be said for Agave Racing Stable’s Street Fancy, who won the Grade I $300,000 Starlet Stakes at Los Alamitos two back on Dec. 12. Eased last out in the Grade II $150,000 Las Virgenes Stakes on Feb. 6 behind Songbird, the late-running daughter of Street Sense will look to return to the winner’s circle for the powerful Phil D’Amato barn. Jose Lezcano rides from post six. Local stakes winners Venus Valentine and Stageplay head the Fair Grounds-based contingent. Owned by breeder Rosemont Farm, Tom Amoss-trained Venus Valentine shocked the masses when she ran down Midnight On Oconee in the Grade II $200,000 Rachel Alexandra Stakes last out on Feb. 20 at odds of 74-1. A confirmed late runner with minimal early pace, the daughter of Congrats will break from post three under Corey Lanerie. Stageplay was a disappointment when fifth last out in the Rachel Alexandra for owner-breeder Mike G. Rutherford and trainer Steve Asmussen as the 3-5 favorite. A two-time stakes winner, the attractive gray daughter of Curlin took the $150,000 Silverbulletday Stakes one race prior on Jan. 16 impressively under Florent Geroux, who rides her for the third consecutive time when they break from post four. The new Asmussen filly on the scene is Winchell Thoroughbreds’ Adore, who was a smart winner last out when taking an allowance/optional claiming event on Feb. 21 at Oaklawn Park by four lengths. A winner of two of three career starts, the daughter of Big Brown has been training very well, including a bullet five-furlong work on Mar. 14 in 1:00.60. Julien Leparoux rides from post five. Cottonwood Stables’ Midnight On Oconee has done nothing but run well against some of the best stakes fillies of her generation, yet has not gone off below 9-2 in any of her stakes tries. Second in both the Silverbulletday and Rachel Alexandra, the daughter of Midnight Lute was valiant in defeat in the latter after racing in proximity to a swift pace and then fighting the length of the stretch in a race that by all accounts collapsed in on itself. Trained by Larry Jones, who has won three of the last eight Fair Grounds Oaks, the consistent charge must be respected when she breaks from post two under James Graham. Stoneway Farm’s graded stakes-placed Dream Dance looks to kick off her sophomore season in style for trainer Neil Howard when the daughter of Afleet Alex starts on Saturday. Disqualified from third last out in the Grade II $200,000 Golden Rod Stakes, the bay filly has been consistent against tough company and breaks from post seven under regular rider Brian Hernandez, Jr.
Charles Fipke’s Dallas Stewart-trained Northwest Tale rounds out the field for the 49th running of the Fair Grounds Oaks. A sharp winner going six furlongs in allowance ecompany last time, the daughter of Tale of Ekati was a well-beaten fifth in the Silverbulletday and must prove a propensity for route racing in order to compete at this level. Javier Castellano picks up the mount from the rail.